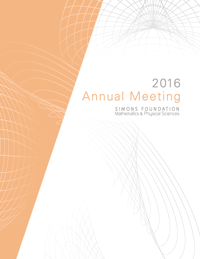 The 2016 annual MPS meeting took place October 20–21. It featured exciting talks about research at the frontiers of math, physics and theoretical computer science, as well as lively discussions among the heterogeneous crowd of attending scientists. The keynote speaker, Mina Aganagic, talked about math and string theory duality. In string theory, it is often the case that there are two very different mathematical descriptions of the same physical situation. The two descriptions are dual to each other, and the dictionary that translates from one description to the other is highly non-trivial. This leads to very surprising conjectural equivalences between mathematical objects that seem to be very different. In many cases, mathematicians have been able to prove these equivalences. The equivalences are very powerful, since they can relate very difficult computations, such as counting curves of given degrees in an algebraic manifold to much simpler classical computations in the dual picture. The dualities can also be used for defining new quantities such as knot invariants. Aganagic surveyed several notable dualities and ended with the announcement of a recent proof, due to Frenkel, Okounkov and herself, of a quantum geometric Langlands correspondence, which generalizes the classical geometric Langlands correspondence, itself a major result. The proof relies on an electromagnetic duality theory in six dimensions and the introduction of a quantum version of K-theory. Lisa Manning talked about jamming in biological tissue. Such tissues start out in the early embryonic stage as solid-like structures and later become fluid like. Such transitions are crucial at the developmental stage. Manning described how movement occurs in completely jammed media, with cells “pushing” their way through the interfaces between other cells, changing the cell arrangement. She then described the phase diagram for such motion and related it to geometric features of the cell. Such features can be measured in static pictures, so we can learn about cell dynamics from static data, which is more readily available. The model fits observations very well. Dan Boneh showed how cryptographers are using sophisticated mathematical constructions to achieve amazing technical goals that are at the heart of electronic commerce. In particular, he showed how the Tate pairing, a bilinear product which originates in abstract algebraic number theory, is used in credit card chips for fast authentication. Other constructions of cryptographic primitives coming from lattices are used to construct homomorphic encryption schemes, which allow computations on encrypted data, such schemes could be of great value in cloud computing environments if we could make them work a bit faster. Boneh challenged the mathematicians in the crowd to come up with new constructions based on higher math, for example, trilinear forms with some nice mathematical and computational properties, and explained that they could lead to some spectacular new applications. Paul Seidel described ongoing work related to mirror symmetry. This symmetry is one of the deep dualities originating in string theory, which was described in the talk by Aganagic. It relates two seemingly different areas of mathematics: the rigid world of algebraic geometry and the more flexible world of symplectic geometry. Understanding mirror symmetry is the subject of one of the current MPS collaborations. For suitable algebraic manifolds, the string theory of the manifold leads to a formal two-parameter partition function that “counts” holomorphic curves on the manifold. Seidel described calculations of the partition function in a particularly challenging non-perturbative regime, where one of the parameters is not infinitesimally small. Andrea Alu described some new devices with magical optical or acoustic properties. A basic feature of optical and acoustical systems is time reversal symmetry. If light or sound can propagate from A to B, then it can be reversed to propagate from B to A. Alu explained how he designs devices that break time reversal symmetry by introducing a rotational asymmetry in the system. As a result, the devices can route sound or light in an asymmetrical fashion to different destinations. Another application is in cloaking, in which an object becomes invisible. Alu complemented these demonstrations with theoretical results which show that, while cloaking with respect to a particular wavelength is possible, it is impossible to achieve for a broad band of the spectrum under rather mild assumptions on the system, explaining why many attempts are doomed to failure. Rick Schwartz discussed the classical and very difficult problem of finding arrangements of points on the sphere that minimize some given standard energy function, which are based on distances between the points of the arrangement. In particular, he discussed the case of five-point configurations, where he was able to prove the rather natural conjecture that the energy-minimizing configuration consists of the north and south poles and an equilateral triangle on the equator. The computer-assisted proof required breaking up the configurations space into many small pieces and carrying out delicate numerical estimates for the minimum possible energy in each piece. Daniel Eisenstein talked about dark energy and cosmic sound. He described how acoustic signals from plasma that were set free a short time after the big bang and traveling at 57 percent of the speed of light can be used as a particularly accurate ruler for accurately measuring distances between objects in the universe. Julia Hartman talked about basic invariants of fields. Fields are very basic objects of study in algebra; they consist of systems with operations of addition and multiplication that satisfy all the usual properties we are familiar with. Of central interest in mathematics is the study of solutions to polynomial equations in a given field. The case of linear equations is covered completely by linear algebra. The next case of a single quadratic equation in several variables is already very challenging. A basic invariant of the field, the u-invariant is the largest number of variables for which one can find a quadratic equation with no non-zero solution in the field. Hartman described works from the last few years that have allowed the computation of u-invariants in many cases of interest. The relationship between mathematics and physics has a long history. Traditionally, mathematics provides the language physicists use to describe nature. In turn, physics brings mathematics to life, by providing inspiration and interpretation. String theory is changing the nature of this relationship. Aganagic will try to explain why and give listeners a flavor of the emerging field. Mina Aganagic applies insights from quantum physics to mathematical problems in geometry and topology. She made deep and influential conjectures in enumerative geometry, knot theory and mirror symmetry using predictions from string theory and M-theory. Biological tissues are living materials, with material properties that are important for their function. Recent experiments have shown that many tissues, including some involved in embryonic development, lung function, wound healing, and cancer progression, are close to a liquid-to-solid, or “jamming,” transition, similar to the one that occurs when oil and liquid are mixed to make mayonnaise. In mayonnaise and materials like it, a disordered liquid-to-solid transition occurs when the packing density of oil droplets increases past a critical threshold. Over the past 20 years, physicists and mathematicians have made progress in understanding the universal nature of this transition. However, existing theories cannot explain observations of jamming transitions in confluent biological tissues, where there are no gaps between cells and the packing density is always unity. Manning will discuss a theoretical and computational framework for predicting the material properties of such biological tissues, and show that it predicts a novel type of critical rigidity transition, which takes place at constant packing density and depends only on single cell properties, such as cell stiffness. She will show that our a priori theoretical predictions with no fit parameters are precisely realized in cell cultures from human patients with asthma, and she will discuss how we are applying these ideas to understand other processes, such as embryonic development and cancer progression. Lisa Manning started her research career in the physics of glasses, i.e., how a disordered group of molecules or particles freezes into a rigid solid at a well-defined temperature. She then turned her attention to morphogenesis, the process by which embryos transform from a spherical egg to a shape we recognize as an insect, plant or mammal, showing that aspects of this process could be modeled by surface tension in analogy with the description of immiscible liquids. Her most recent work uses ideas from the physics of glasses to describe the mobility of cells organized in sheets and applies to a broad class of biological tissues, including embryos and cells from asthma patients. Arithmetic geometry views algebraic and arithmetic objects, such as numbers, in a geometric way. This interplay between number theory and algebraic geometry has been a source of inspiration in modern mathematics, as it permits the study of number theoretic problems via geometric methods. Having led to the solution of a number of conjectures, including Fermat’s Last Theorem, it continues to give rise to deep and important problems in algebra. Local-global principles are a central theme in this interplay of subjects, and many important mathematical problems can be expressed in terms of such principles. Local-global principles in algebra (and other mathematical disciplines) are motivated by analogous geometric principles, by which certain properties of spaces can be determined by considering whether or not they hold locally. The talk will explain these concepts and outline how patching methods can lead to new local-global principles. Julia Hartmann has been a professor at the University of Pennsylvania since 2014. Prior to that, she was the head of a research group at RWTH Aachen University and a von Neumann Fellow at the Institute for Advanced Study. Hartmann’s research focuses on problems in algebra with relations to differential algebra and arithmetic geometry. The connecting theme of the questions she works on is the study of symmetries, i.e., of actions of groups on various algebraic objects. In collaboration with David Harbater, she developed the method of field patching. Among the most exciting applications of field patching are local-global principles for numerical invariants associated to fields. Cryptography, the science of secure communication, has advanced considerably in the last fifteen years. With the introduction of tools, such as bilinear maps, multilinear maps and integer lattices, applications that were previously out of reach became possible and sometimes even quite practical. This talk will survey some of these recent developments, giving examples of constructions and proofs techniques, and posing some open problems that are central to further progress. Dan Boneh is an expert in cryptography and computer security. One of his main achievements is the development of pairing-based cryptography, giving short digital signatures, identity-based encryption and novel encryption systems. Daniel Eisenstein will discuss how the acoustic oscillations that propagate in the cosmic plasma during the first million years of the universe provide a robust method for measuring the cosmological distance scale. The distance that the sound can travel can be computed to high precision and creates a signature in the late-time clustering of galaxies that serves as a standard ruler. Maps from the Sloan Digital Sky Survey (SDSS) reveal this feature, yielding accurate measurements of the expansion history of the universe. Eisenstein will describe the theory and practice of the acoustic oscillation method and highlight the latest cosmology results from SDSS. Daniel Eisenstein is a leading figure in modern cosmology. He is known for utilization of the baryon acoustic oscillations standard ruler for measuring the geometry of the universe, which underpins several large, upcoming ground and space missions. Eisenstein blends theory, computation and data analysis seamlessly to push the boundaries of current-day research in cosmology. Symplectic topology is unique within geometry, in that the deeper structure of the spaces under consideration appears only after non-local “instanton corrections” have been taken into account. This is most readily apparent from a string theory motivation, but it also has a direct impact on classical problems from Hamiltonian mechanics. In the theory, the instanton corrections are set up as small perturbations, which corresponds to thinking of the target space as having infinitely large size (the “large volume limit”). Mirror symmetry suggests that it would be interesting to keep the size finite. Attempting to do that has seemingly paradoxical consequences, which one can sometimes get a handle on by changing the space involved. The talk will give an introduction to this problem, based on simple examples, and explain a little of what is known or expected. Paul Seidel has done major work in symplectic geometry, in particular on questions inspired by mirror symmetry. His work is distinguished by an understanding of abstract algebraic structures, such as derived categories, in sufficiently concrete terms to allow one to derive specific geometric results. On the abstract side, Seidel has made substantial advances toward understanding Kontsevich’s homological mirror symmetry conjecture and has proved several special cases of it. In joint papers with Smith, Abouzaid and Maydanskiy, he has investigated the symplectic geometry of Stein manifolds. In particular, work with Abouzaid constructs infinitely many nonstandard symplectic structures on any Stein manifold of sufficiently high dimension. In this talk, Andrea Alù will discuss recent work focused on breaking reciprocity and time-reversal symmetry in metamaterial structures, spanning acoustics, radio waves, nanophotonics and mechanics, without relying on magnetic bias. Alù’s and his collaborators’ approaches are based on using suitably tailored mechanical motion, spatio-temporal modulation and large nonlinearities in coupled resonator systems to realize unusual wave-matter interactions. Alù will discuss the theoretical framework and the modeling, design and implementation of non-reciprocal devices that break Lorentz reciprocity and achieve electromagnetic isolation without using magnetic bias. He will also discuss the impact of these concepts on things ranging from basic science to integrated technology, and how this platform may be at the basis of topological insulators for light, sound and mechanical waves. Andrea Alù’s work on the manipulation of light in artificial materials and metamaterials has shown how clever designs may surpass what had previously been thought to be limitations on wave propagation in materials. He has developed new concepts for cloaking, one-way propagation of waves in materials, dramatic enhancement of nonlinearities in nanostructures and ultrathin optical devices based on metasurfaces and twisted metamaterials. Thomson’s problem, going back to 1904, asks how N points on the sphere are arranged so as to minimize the Coulomb potential, i.e., the sum of the reciprocal distances taken over all pairs of points. A generalization involves using other power law potentials besides the Coulomb potential, i.e., summing other powers of the distances over all pairs of points. The Coulomb potential corresponds to exponent -1. The case N = 5 has been notoriously intractable. Schwartz will sketch my computer-assisted but still rigorous proof that the triangular bi-pyramid is the potential-minimizing configuration with respect to all power laws with exponent in [-13, 0) and the potential-maximizing configuration when the exponent is in (0, 2). As Schwartz will explain, these ranges of exponents are fairly sharp. Richard Schwartz was born in Los Angeles in 1966. In his youth, he enjoyed video games and sports, especially tennis. He got a B.S. in math from University of California, Los Angeles in 1987 and a Ph.D. in math from Princeton University in 1991. He gave an invited talk at the International Congress of Mathematicians in 2002. He is currently the Chancellor’s Professor of Mathematics at Brown University. He likes to study simply stated problems with a geometric flavor, often with the aid of graphical user interfaces and other computer programs that he writes himself. Aside from his work in math, he has written and illustrated a number of picture books, including You Can Count on Monsters, Really Big Numbers, Gallery of the Infinite and Man Versus Dog.